NOW 600mg! 20% MORE! 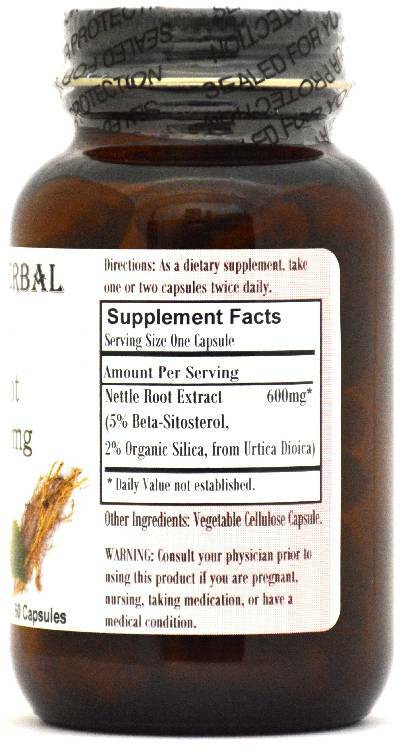 Barlowe's Herbal Elixirs brings you a powerful Stinging Nettle Root Prostate Formula Extract. Nettle has been used for centuries to treat painful muscles and joints, gout, and prostate problems. Bottled in Glass! No Stearates! No Fillers! No Junk! NOW 600mg! 20% MORE! 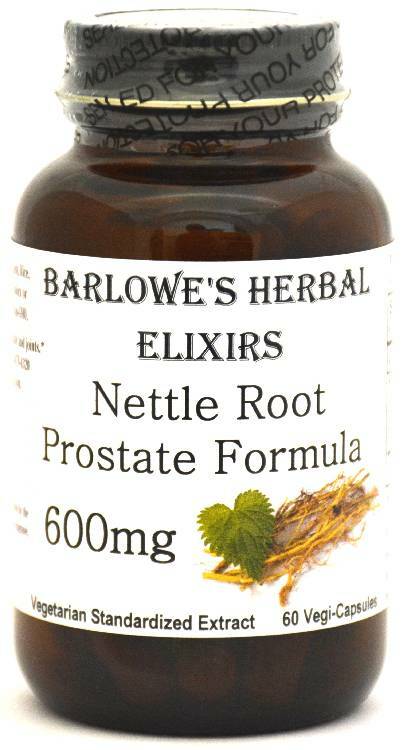 Barlowe's Herbal Elixirs brings you a powerful Stinging Nettle Root Prostate Formula Extract. 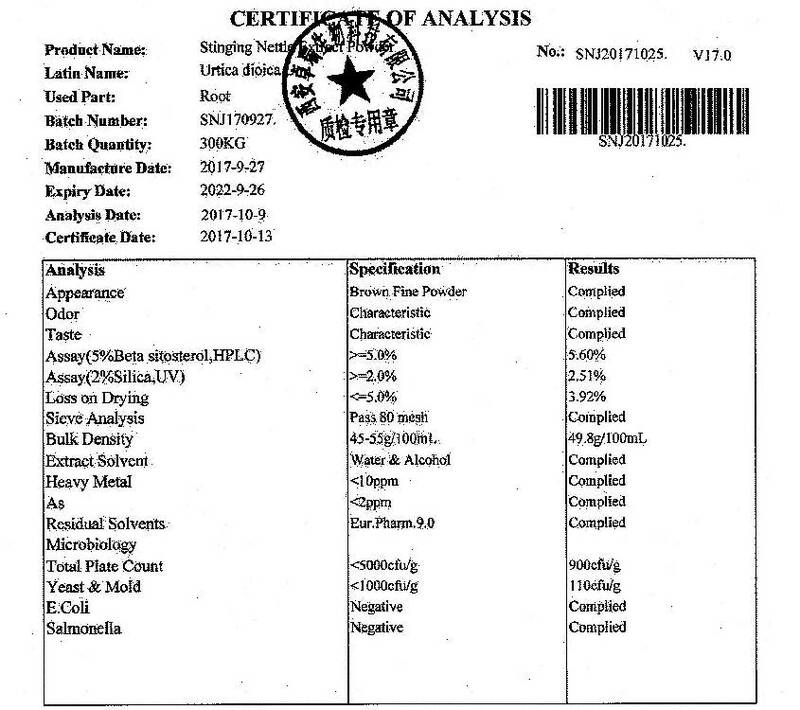 The Nettle Certificate of Analysis (COA) for this particular batch is shown above. Although Nettle (Urtica dioica) has been utilized for hundreds of years to treat a variety of ailments, it is primarily of interest now because it has been discovered that it has prostate and joint health benefits. Bottled in Glass! No Stearates! No Fillers! No Junk! ***These vegetable-derived capsules (Vegan, Kosher and Halal certified) are filled on slow speed equipment and only pure, unadulterated herbal extract is contained in the capsules. There are no magnesium stearates, fillers, gelatin, silicates, gluten, corn, wheat, rice, yeast, starch, titanium dioxide, artificial colors, artificial flavors or preservatives. Capsules produced with high speed equipment in herbal and dietary supplement "factories" generally contain several other ingredients, including powdered lubricants called STEARATES (which can greatly diminish an herb or supplement's absorption into the body). Check their labels! Barlowe also bottles his products in glass as he believes chemical vapors can vent from plastic containers and contaminate the contents. Although nettle root contains a substance that slows binding of free testosterone by SHBG, if that is the primary reason for purchasing nettle root, you are much better off purchasing High Potency Nettle Root which is also found on this website. The High Potency Nettle Root has been extracted and standardized for the substance which slows binding by Globulin. This Prostate Formula product is primarily for prostate, skin, and joint health. Caution: Barlowe's Nettle Root Prostate Formula is generally safe, but it is should be utilized with care. This product is for dietary use. If side-effects occur, discontinue use immediately! The above statements have not been evaluated by the Food and Drug Administration (FDA). This product is not intended to diagnose, treat, cure, or prevent any disease.